As a way to commemorate its 8th anniversary, Chinese smartphone giant Xiaomi is set to unveil its brand new flagship device on May 31. It's expected to carry the Mi 8 name, feature top-of-the-line hardware, an iPhone X-like vertical camera, and also bring Xiaomi onto the notch design bandwagon. Interestingly, the notch on this one is expected to carry a slew of infrared flood sensors that will reportedly allow for face recognition and... Xiaomi's own take on the trendy AR emoji. The company itself posted on micro-blogging network Weibo just recently, hinting that a "A big wave of cuteness is coming, " accompanied by the dead giveaway that is a slew of animated emoji looking very similar to Apple's own animoji. 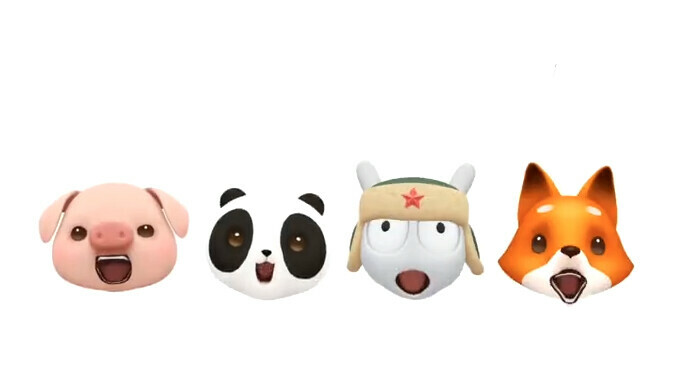 They feature a slew of cute animal faces, including Xiaomi's own mascot. At this point it doesn't seem Xiaomi's interpretation of animoji doesn't bring anything new or beneficial to the table aside from blindly following Apple's footsteps with the "monkey see, monkey do" mantra that's plaguing the majority of China-based manufacturers. Xiaomi was on the right track with it exceptional Mi Mix 2s, a surprisingly well-done bezelless device, but it looks it could be taking an unfortunate detour with the Mi 8. A detour that will most certainly further postpone its arrival on the US market due to the numerous patent implications and predicaments the Mi 8 will likely introduce. In terms of hardware, Qualcomm’s Snapdragon 845 will power the smartphone, coupled with either 6GB or 8GB of RAM. Additionally, 128GB of internal storage will be on offer. On the software side of things, Android 8.1 Oreo will ship straight out of the box with the MIUI 10 custom overlay on top. Lastly, in terms of a release date and pricing, the Xiaomi Mi 8 is expected to go on sale towards the beginning of June, with pricing rumored to start at roughly $470. Here's more to know about the upcoming phone. And why would they not copy it. It was a success in iPhones why would they bring the same features to their customers. They copied many of the animals almost identically. At least Samsung did something different. Thought the same thing, people are so easily offended these days. I totally agree with the title. Companies with no originality trying to 'ape' the so called leaders for a market share. Nothing wrong with the title. It's a great title. It explains exactly what Xiaomi is doing. Xiaomi is doing this copy iPhone thing to the max. Shameless copying. Why people bother buying these unoriginal products is beyond me. Maybe because there are a lot of people that can't pay $800 to $1000 for a phone. There are cheaper alternatives without resorting to such shameless copying. Don’t state the obvious. Why u care whether it's copied or not ? if you are so that original why on earth you click on that article anyway ? If you don't like it don't buy it! Simple as that. So what. This is now a world of other manufacturer coping the other. We all may as well get use to it. Why do Chinese companies always copy Apple? Because they are following their leader and to have some of that apple pie which will they never achieve. If they keep growing at the current rate Xiaomi will catch Apple in terms of market share within 3 to 4 years. Not too shabby for a privately owned Chinese company that has hardly moved out of China and India. In Xiaomi’s defense, their animojis are a lot cuter.